Social Media has rippled down to almost all parts of life, whether its politics or the daily life, the world around is online, all the time. Although it took some time, but the wave of virtual connectivity has started sweeping off the traditional real estate market too. There was a time when realtor used to provide onsite visits, today the brick-and-mortar sample flats have been replaced by property’s photos on Instagram, and virtual walk-through on the Vine and YouTube. According to a survey by National Association of Realtors, 91% of the brokers, developers, and real estate agents, around the world are active on social media for business purposes.Let us look at the implications of this movement. With 1415 million active users on Facebook, 700M for WhatsApp, 347M for LinkedIn, and 288M active twitter users, the potential that these social platforms hold for generating leads is also very high. For a market like Real Estate, whose basic functioning and existence is off-line, it becomes a challenge to tap the world of opportunities available on the internet. However, real estate giants around the world, have not only started exploring the social media platforms, but have also created a strong brand resonance through their social efforts. With the help of social media the developers can easily provide information about their brand to the masses, at a very low cost. For the property buyers too, it becomes easy to connect with sellers and developers, while checking their credibility over the internet. Irrespective of what side you are on the property market, the benefits of going social are manifold. · It is an ideal place to create trust, credibility, and build reputation with the masses about the brand.A strong brand presence will not only ensure identification among the potential buyers/sellers but also a chance to emerge as a leading market player. · It is a great way for the real estate developers to find prospective clients and be in contact with the present ones. Through social media, they can easily answer client’s doubts and questions both about the project and locality. · An effective social media plan is the most effective way of becoming an industry expert. They will get a chance to network with other developers and industry experts. This will give them new ideas for marketing and promotional, launches activities that will bag them maximum customers. The perks of being online are manifold. But it might not turn out as beneficial as you must have imagined, if you don’t play the cards right. It is indispensable to know what platforms will benefit your company most, and which may prove as a waste of time and money. With over 700 Million active users, Facebook is one of the fastest growing social platforms. It is also considered as one of the most lead generation friendly websites. The shortest way to fame via Facebook is by opening a company page. On the page you can share new property listings, walkthrough videos of the project, pictures and reviews of happy customers. You can also create events like Open Houses and send invitations to the prospective customers in your friend list. If you are being too creative, create competitions like quiz, or best review contests to popularize your brand. It is the best platform if you want to tap both Indian and international real estate market. Through the hash tag mechanism, you can easily find out what people are talking about you and turn that conversation in your favor by messaging them directly. By posting messages every 5 minutes, having hash tag and links to the company website, it won’t be difficult to come under recent searches and be popular. For e.g. create hash tag #PropertyinKolkataand adda link to the page that displays listings of property in Kolkata. 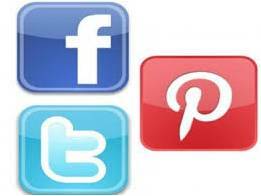 It’s an application through which one share (pin)images and videos from all over the internet on their page. If liked by other users, the pin is then repined or shared on their page. It is the best platform if you are looking for a quick ripple effect. House listings, information about the location, company photos, interior design and organization hacks photo are some of the most used pins by India’s leading real estate companies. Along with all of this, you should give a short description and a link to the website. Start a real estate blog to provide users rich content on the property market. Blogging is one of the only ways to come around as industry experts.All you need to do is start a blog and give information and insights of locality, your project, market trends, etc.create a niche in the market by having an active blog where you post on a regular basis. From interacting with present and prospective clients to emerging as an industry expert, social media platform is the easiest and sure-shot way of expanding a profitable business. The demand for being virtually active has made it a remarkable time for the company to enhance their social presence and create a higher brand resonance. Interesting information to know about! Have a beautiful week!